You are here: Home / Tanking / Treeeeenkeeeeets!! Trinkets are small and shiny. It is it nothing but your best interest to get your grubby paws on as many trinkets as you can as quickly as you can. Kidding aside, whatever two trinkets you decide to toss into those slots will make a huge difference to your gear choices and how you approach specific fights and hurdles that would otherwise be a problem. Unfortunately, there really aren’t that many choices when it comes to trinkets as in any given tier of content, there are usually only two or three trinkets that are worth going for. To prepare for the upcoming expansion in December, it would behoove you, as a tank, to snag the strongest ones that you can for the current content to aid you in potentially leapfrogging the early dungeons or making it a little easier on your inevitable pug healer woes. To that end, I’m going to highlight the strongest choices for trinkets in this current tier of content, in the hope that you still have a decent amount of time to shoot for them and hopefully snag one or two. The two strongest trinkets are probably both ones found in ICC. The strongest one is Sindragosa’s Flawless Fang which drops off of (surprise!) Sindragosa herself. The huge chunk of stamina on the trinket is definitely welcome but it also sports a deceptively useful “use” effect which can make a big difference in any number of fights sporting sudden spikes of elemental damage. Notably, something like the Festergut fight if you happen to miss a stack or two of the debuff or a Deathwhisper fight when your interruptors are a little lacking can be saved with a judicious use of this trinket. The second trinket to keep an eye out for is actually a bit of a tossup. There’s something to be said for the trinket from Professor Putricide in the 10 man difficulty, whether it’s the heroic version or not. While it doesn’t have any neat use effects, more health, especially in light of the percentage scaling ICC buff is hardly something to laugh at and the trinket enjoys a pretty consistant uptime. 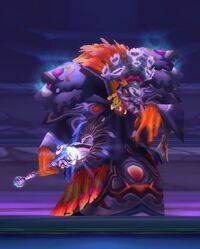 On the other hand, the tanking trinket that drops from Halion can be given mention too. While it doesn’t sport the extra health, the large amount of bonus armor can definitely boost your survivability when it comes to bosses that deal a great deal of physical damage while the dodge proc definitely has potential to save you from an untimely demise. The only problem with it is, of course, being dodge, while it MAY save your life, there will also be situations where the trinket procs and the extra chance to dodge doesn’t go your way and gets you killed anyway. So that one’s really a matter of personal preference depending on your playstyle, whether you’d rather stack the surefire health which will help against all forms of damage consistantly, or if you want to stack some armor for mitigation and rely on the fickle mistress of Chance to see you through a trinket proc safe and sound. I think that the Juggernut trinket from ToC 25 is a noteable trinket due to the large HP gain from it. the trinket from Put in 10 man doesnt seem to proc that well for me when i use it. Also the badge trinket is great for stacking stam as well. I currently use, Frost badge trinket, sometimes Helion trinket and sometimes the Juggernat trinket. Well the only one of the trinkets you mention that drops in 10 man difficulty is the PP10 trinket. In addition, when you review this trinket you should look first at the armour, and second at the stamina buff. It’s an extremely strong trinket choice. With the 4.0.1 patch nerfing bonus armor alot. This will probably change people’s trinket choices. Like the 245 badge armor trinket now has no armor just an on use dodge effect. I’m using the skeleton key and the heroic dodge trinket from 10 man lootship. Reforged the dodge to master.